spacecraft microbiome – Engineers work on Opportunity (in its cruise configuration) in a cleanroom at Kennedy Space Center. A very important part of planetary protection is keeping contaminants from humans from riding aboard spacecraft. The pictured engineers are donning “bunny suits” that only allow their eyes to be exposed. 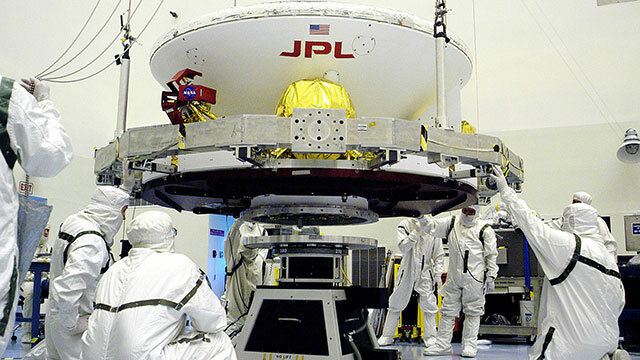 Spacecraft assembly facilities harbor a low but persistent amount of biological contamination despite the use of clean rooms. Despite extensive cleaning procedures, spacecraft can host a diverse collection of microorganisms, often called a spacecraft microbiome.